Club Penguin Cheats by Mimo777 Club Penguin Cheats by Mimo777: New Club Penguin Mission 11 Sneak Peek! SWEET! I wonder wut Herbert is up to. BTW, u on CP? He's probably trying to control all the penguins minds. Hi mimo I am excited yay. Uhh bye. He's probably trying to control all penguins minds. bluecopper(JUST FOUND OUT ABOUT YOUR WEBSITE AND IT IS AWESOME! Wow! I can't wait! Oh, and where were you? Oh yeah, the grey dancing penguin is in the picture! HE'S GONNA BRAIN WASH THE PENGUINS OF CLUB PENGUIN ISLAND!!!! OH NO OH NO OH NO!!!!! Mimo randomly gets on CP, but if you want to meet him you have to find out when he is having a CP Party. Hope I helped. i think he will eat all earth day plants :O lol! How exicting! :D I can't wait! WOW!!! Its about time they told us when it was coming! Glad you like the site. To become a mod, read the mod post. It's easy to spot, just look around. The basics are that you answer questions or comment on other people's posts like I am doing right now. Then add CPG Mod next to your name. Hope this helps! I'm a PSA and i have completed all the missions before my first years on CP. I'm on like my second or something year. lol. Well bye! Why would he make a movie? is he tring to make penguins who don't know about him love him? Herberts making a movie, he wants penguins who don't know about him to love him, and make him the leader. thats my guess. what will happen if we complete all missions? i thing he shows there that he has stolen all the puffles and we have to give him all our pizza's to get them back. THAT WOULD BE A DISEASTER!!! The brown penguin looks sad like he is being he is being help captive! The screen is also in front of the Ski Lodge which means that the TV might be a distraction! In older missions, Herbert said he hated CP because of the cold and he wanted to use the Ski Lodge for a lifetime supply of firewood! He's gonna use the big screen to hypnotise all the penguins into working for him! Thanks Mimo for the Sneak Peek! Finally! Glad you are back Mimo! If you want to be a CPG Moderator, you should answer people's questions. (Just like me!) After you had an excellent work on modding you will be listed on the moderator list! You can be a moderator up to a Top Moderator. Once you become a Mimo Mod, you'll be added on CP by Mimo777! WHAT?! END OF MAY?! IN JANUARY IT SAID EARLY APRIL! THIS IS RIDICULOUS! Welcome! Oh and by the way when you are commenting please don't use all caps because you are hurting our ears(and is also one of mimo's rules).I hope that you will become a mod. Me neither.I hope its quite difficult. Hey coolgem u don't have to put 'Trying to be CPG mod'u just put (CPG MOD) after your name.Hope I helped! The ds game is coming out end of next month. So is the new mission... Coincidence? In the preview of the ds game, they show a part of the last mission... More coincidence? The mission was postponed, and then soon after we heard of the ne ds game. Could cp have decided to connect the two, and postpone the mission? 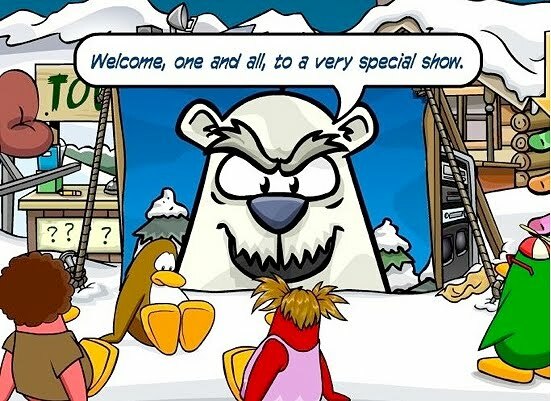 look at the brown penguin he looks sad maybe herbert caught him doing something embarassing andwants to show everyone cause he was herberts assintant but left and tried to stop herbert so now hes gonna embarrass him! lol. Funny picture. He's all like,"welcome, one and all,"
You know the EPF, right Mimo? Well today, I finished Mission 101 Only three more missions! Why is the brown penguin sad? Does he like T.V.? No one really knows right now. May 25 is coming though! P.S. help me shuld i become a mod? dude this is gonna be reall fun by the way mimo i just wanted to know that which was the first pin in cp ? -thankx for all those helps! Omg Mimo! thats soo cool And.... Herebert is probally going to steal penguins and he tries to make plants out of them! and then he chops the plants and sets Cp On fire and floats away on the iceburg! Ok well maybe he wont burn CP or mak plants out of penguins but! He probally will catch penguins though! I think Herbert will grow the plants and make more oxygen. so he can make the island more warmer. LOLzz. Herbert and his friend , Klutzy might hypnotize all the penguins!